Hand–foot syndrome (HFS) is a common adverse event that can be induced by capecitabine. It is hypothesized that capecitabine (Hoffmann-La Roche Inc.) based chemotherapy can cause overexpression of COX-2 in tumor and healthy tissue, which finally induced HFS in hands and feet. Based on this, we believed that a selected COX-2 inhibitor (celecoxib, Pfizer Pharmaceuticals LLC) could ease HFS. We designed a prospective clinical study to test the hypothesis. 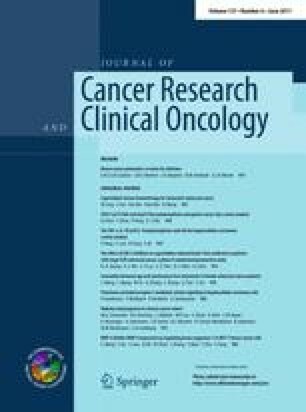 From August 2008 to January 2010, 110 patients with stage II/III colorectal cancer who were eligible for adjuvant chemotherapy were enrolled in the study and divided into 4 groups by random, but 9 patients did not finish at least 4 cycles of chemotherapy. There were sixteen patients in capecitabine group, and fifteen patients in capecitabine and celecoxib group. Thirty-four patients were in XELOX (capecitabine plus oxaliplatine) group, and thirty-six patients in XELOX+ celecoxib group. All 101 patients finished chemotherapy and follow-up interviews. The group that had received capecitabine and celecoxib had a significantly reduced frequency of >grade 1 hand–foot syndrome (29 vs. 72% P < 0.001), and >grade 2 (11.76% vs. 30% P = 0.024). Five patients experienced grade 3 HFS in capecitabine group and only 1 patient had grade 3 HFS in capecitabine and celecoxib group. There were 5 patients in capecitabine group who refused to go on chemotherapy because of HFS, but there was none in capecitabine and celecoxib group. From the result of this study, we could learn that celecoxib could reduce HFS that was induced by capecitabine. So we recommend that celecoxib can be used in capecitabine-based chemotherapy. Rong-Xin Zhang and Xiao-Jun Wu contributed equally to this work. We are very thankful to Zhi-heng Peng and Zi-yi Huang for the acquisition of data. We declare that there is no conflict of interest in this study.